The salt ponds on the western side of the island of Kauai are an ancient harvesting place for Hawaiian sea salt. Hawaiian sea salt is available in two varieties: red and black. The red salt is infused with clay, and the black salt contains activated charcoal. Hawaiian sea salt is prized for its flavor and its medicinal properties. Many alternative health practitioners advocate the use of sea salt as a healthful seasoning. They believe that Celtic sea salt, Himalayan sea salt and Hawaiian sea salt all contain natural trace minerals that help balance electrolytes. The more sodium you eat, the more magnesium and potassium you need to keep your body in balance. Sea salt naturally contains magnesium and potassium, but these minerals are removed from standard table salt. By using sea salt instead of table salt, you can maintain your electrolyte levels more easily. Red salt from Kauai is infused with alaea, a type of Hawaiian clay. The clay tints the salt red because it contains iron oxide, which serves as an added nutrient. 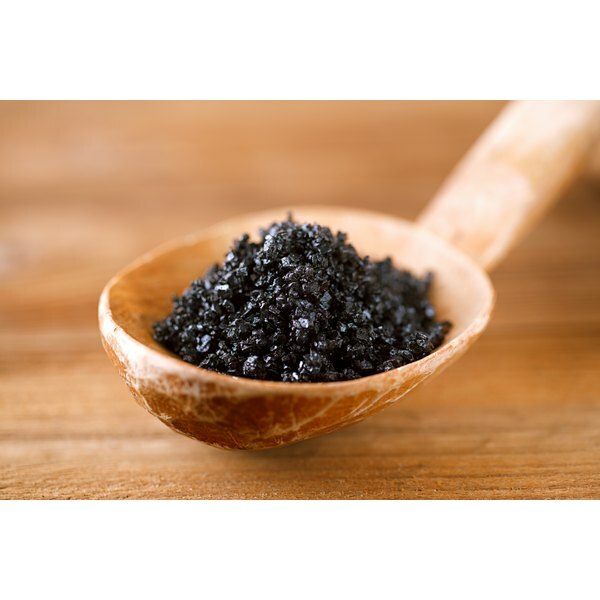 Black salt from Kauai contains activated charcoal, which is used as a detoxification agent and an antidote to poisons. Although Hawaiian salt does not contain a large enough quantity of activated charcoal for it to have strong detoxification properties, this mineral may contribute to the salt's reputation as a health supplement. Hawaiian sea salts have distinctive, strong flavors that make them valued ingredients in cooking. The clay in red Hawaiian sea salt smooths the naturally intense taste of the salt and imparts a subtle nutty flavor. The charcoal in black Hawaiian sea salt gives it a rich, earthy undertone. Most sea salts lose their intensity as they cook, so chefs generally add them to dishes immediately before serving. However, Hawaiian sea salts retain their robust qualities through cooking, which widens the variety of ways they can be used. Although the human body needs salt to function, too much salt can cause high blood pressure and water retention. Despite its mineral content, sea salt's biggest advantage is that it has a stronger flavor than table salt, so you can use less of it for the same effect. Use salt of any variety in moderation. You can reduce your sodium intake by limiting the amount of processed food you eat and cooking your own food with sea salt instead. Ecologist: What Type of Salt is Best? MayoClinic.com: Is Sea Salt Better for Your Health Than Table Salt?